Azuba is a captain's wife and lives without her husband for long periods of time on the coast of New Brunswick. She's all alone when she loses their second child. This is sad of course but Azuba spends most of her time moping about how she expected to sail the world with her husband when she got married. When Nathaniel returns, he finds Azuba mired in scandal. It's much ado about nothing but this is the 1860's so it's a Big Deal. Since she's "disgraced herself," he takes her with him on his next voyage. Azuba gets her wish but is not too happy about the way it was granted. She mopes some more and Nathaniel acts like a bossy jerk. They glare at each other and there are many awkward silences. At this point I wondered if I was ever going to warm up to Azuba. But then, there is peril on the high seas. Storms, starvation, and piracy, fairly realistic stuff (no krakens). They also manage to have good times exploring the world. Azuba finally picks herself up and acts like a grown-up. That's when I gobbled The Sea Captain's Wife up. What I liked about The Sea Captain's Wife by Beth Powning was that it wasn't just a story about sailing around the world. It has a lot of heart. Azuba and Nathaniel married each other for the same reasons they wanted to change after the wedding. They don't know or understand one another until they are thrown together. By the end, I wondered how things would have turned out for them if they hadn't had that shared experience. I'm also fascinated with the life of a captain's wife. Azuba has a very small space in which to live on board with a five year old. Just thinking about it makes me feel that I'd hop over the rails from claustrophobia. Even at sea women have very little freedom. I remember seeing a captain's wife diary at the bookstore. I must get it and compare fact to fiction. I ended up enjoying The Sea Captain's Wife despite the slow start. At the end I was rooting for Azuba. However there was a scene that was an equivalent to a cop show's "I have 2 days to retirement" where you know something awful is about to happen. I also found that the Epilogue didn't do anything for me. I wanted a few questions answered and that didn't happen. It could have been incorporated into the last chapter. I recommend The Sea Captain's Wife to anyone who wants adventure with a realistic portrayal of a couple navigating not just the oceans but their own fragile relationship. 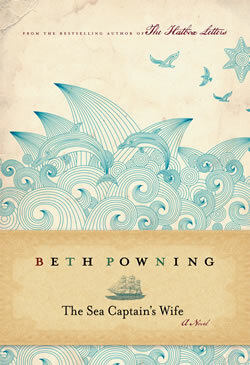 For more information on The Sea Captain's Wife see Beth Powning's website. This sounds really good and I love the look of that cover. I'll have to see if my library has it. Great review, thanks Chris! I like the cover, too! I am not sure I could get past such an aggravating heroine at the start, though! I'm one more who LOVES the cover. Very appealing. This sounds like a really interesting story! I can't imagine what it would be like on the high seas for a woman. Wow. I'd be really interested to see your fact/fiction comparison with the diary! Aarti- I wondered if I'd get over it too but she grew on me. Heather & Care- Love the cover too! Bookish- I'll have to see if I can find it. Thanks for the warning about the slow start, I'll now know it gets better! I liked her earlier novel The Hatbox Leters so I plan to read this one too. Yes, it had a slow start. But as you mention, very realistic too. I loved it.